On more than one occasion I have misplaced my smart phone. My initial response is panic (“What if someone is trying to get a hold of me?”). After this is general acceptance of my disconnectedness. In these opportunities for solitude my mind tends to wander. I cannot check Twitter, Facebook or a Google+ Community, so I seek different forms of cognitive engagement, such as connecting with my family more and attending to the immediate experiences in front of me. With being disconnected, I also find myself reflecting on my experiences and plans for the future. Yes, I miss having the world’s knowledge and diverse communities at my fingertips. But there is a cost to this access. This lead presents a counter to the promise of the Internet facilitating powerful connections among people. There is little doubt that social media and engaging in global and diverse conversations has brought many benefits to society at large, especially for our younger generation studied extensively by Ito and colleagues (2008). Adolescents can feel empowered when they engage in online communities around areas of interest. They can participate at their preferred depth and frequency, either as an observer and/or a contributor. There are no age limits; perceived and actual levels of expertise and curiosity determine the authority that is attributed to a participant. The opportunities provided through social media are not only couched in learning. There are also social and emotional advantages to these new connections, also pointed out by Ito and fellow researchers. “These processes make social status and friendship more explicit and public, providing a broader set of contexts for observing these informal forms of social evaluation and peer-based learning. In other words, it makes peer negotiations visible in new ways, and it provides opportunities to observe and learn about social norms from their peers” (18-19). It is tempting to paint a largely rosy picture of a highly connected world. Yet as I pointed out, there are trade-offs to being “always on”. danah boyd, author of It’s Complicated: The Social Lives of Networked Teens (2014), also finds the benefits that youth reap in “networked publics”, extensions that allows them to “extend the pleasure” (4) of their locally-based friendships. While these online spaces allow for the social interaction that adolescents crave, these digital communities can also create new challenges. For example, students will post something that they believe is temporary, yet can stick around for a long time if the recipient chooses to save it. “Conversations conducted through social media are far from ephemeral; they endure…Alice’s message doesn’t expire when Bob reads it, and Bob can keep that message for decades” (11). Also of concern is how Internet-mediated relationships can alter in-person interactions. Social scientist Sherry Turkle found that the mere presence of a smartphone at a dinner table keeps people’s conversations at more surface-level topics (2015). Guest’s attention is “split” between the present dialogue and what might be happening online. I don’t want to come across as a Luddite when I question the efficacy of learning through social media. My many connections via Facebook, Twitter and blogging have brought formally unattainable knowledge to my work and a richer experience to my world. I just wouldn’t want it to monopolize the life I have in front of me. Ito, M., Horst, H., Bittanti, M., Boyd, D., Herr-Stephenson, R., Lange, P. & Robinson, L. (2008). Living and learning with new media. MacArthur Foundation. Chicago, IL. I don’t want to know how many other faces have been pushed into this toy. 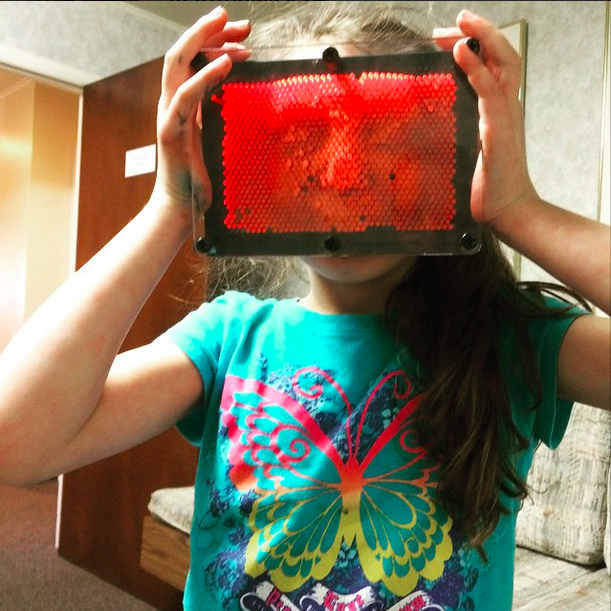 My daughter and I were in a waiting room today, trying to occupy ourselves while my son was with the dentist. I browsed through the magazines available and saw the most recent edition of Popular Mechanics. The title for the cover article was “42 Things You Should Know How to Do at Every Age”. This question spurred a bigger question with me, which is the title for this post. Our staff is starting to discuss how to make our portfolio assessment process more coherent across the grade levels and more authentic for our students. I shared the question out on Instagram, Twitter, a Facebook group, and a Google+ Community. I got zero responses from Twitter and Instagram. No surprise; I have found the bigger the pond, the less likely I am to get a bite. However, three members in the Google+ Community I moderate offered insights worth sharing here. Think critically and be able to support original ideas with evidence. I think it’s important at that age to demonstrate independent thinking and believe in something that they can passionately argue for with conviction and valid evidence. How they do this should be open to individual choice. Know how to safely search the Internet for information based on keywords, and evaluate the authenticity and bias of the resources found in order to make an informed decision about what they have learned. Author Matt RenwickPosted on May 6, 2015 May 11, 2015 Categories Community, Connectedness, engagement, LearningTags big questions, digital student portfolios, essential understandings, Facebook, Google, Instagram, twitter3 Comments on What one thing should a student know, understand, or be able to do by the time they leave elementary school? It is Connected Educator Month. One of the most common events happening are chats on Twitter. I have found that there are three levels of participation when engaging in a Twitter chat. In fact, these are the steps that I took, from being introduced to this online tool, to becoming a more connected educator. This sounds sinister, but it really just means watching tweets go by during a chat. It is actually a great way to become familiar with the process of the moderator(s) posting questions, others responding to the questions, and many learners getting involved in related conversations on the side. Twitter can be very kinetic, and it may take a few chats to get the feel for it. That’s why I like using TweetDeck for these discussions. I can see what is happening within that chat’s hashtag (i.e. 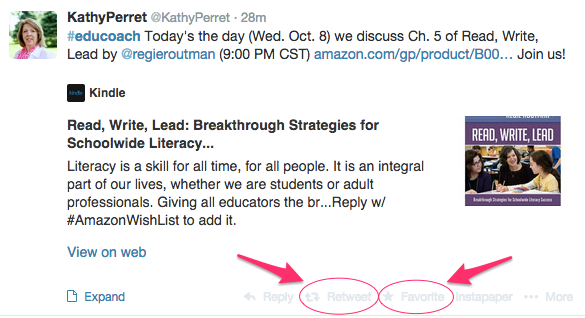 #edchat) while still following my home feed, as well as keeping an eye out for any notifications or messages. Once I felt comfortable talking about a topic for the chat, such as walkthroughs for #educoach, I would start to make my present known in three ways. First, I would reply back to someone’s response to a question, with an affirmation (“Nice idea!”), a retweet, which means sending out their tweet by reposting it on your timeline, or simply favoriting the tweet. Even though I am now more visibly active in these chats, I sometimes don’t mind just sitting back and reading the stream of thinking, with the occasional acknowledgement. When everyone is talking, who is listening? At this point, you feel like an equal in terms being able to hang in with the rest of the group. You’ve got your sea legs, so to speak, in that the process of chatting on Twitter fades into the background so you can focus on the discussion at hand. To start, you simply respond to the moderator’s question (“Q1”) with a response (“A1”). If you are not sure what to say, then don’t. Maybe the question was poor, or you lacked background on the specific topic. Twitter chats are not standardized tests; you don’t get penalized for not answering every item. Sometimes, the responses from others will prompt you to reply to them, with a note of agreement or a clarifying question. One of the limitations of Twitter is that the chats rarely run deep. They really aren’t designed to have in-depth conversations. However, Twitter chats are one of the best ways to make new connections because of the structure. The Q1/A1 is an effective protocol for organizing this fast-paced discussion and allowing the participant to multi-task. If you like someone else’s thinking in the chat, because they share interesting ideas and/or they challenge you, you can follow them. Being followed back by someone you followed is very affirming. This can lead to learning partnerships with that person in other online spaces. The best chats will archive the conversation using tools such as Storify for later review. This is nice in case you couldn’t make the conversation, as they happen in real time. The moderators for these chats usually house their archives on a website, blog, or wiki that serves as their home base. For more information about Twitter in general, check out this recent post by The Two Writing Teachers, or consider taking this free ecourse from Heinemann on using Twitter as an educator. 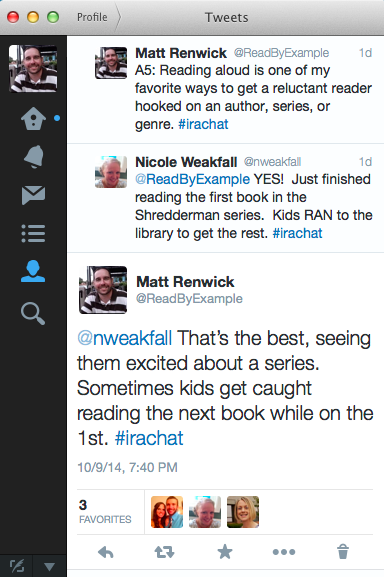 Author Matt RenwickPosted on October 11, 2014 October 11, 2014 Categories Community, LearningTags connectedness, hashtag, PLN, twitter7 Comments on How Do You Participate in a Twitter Chat?